I’ve been meaning to get back around to this building series for a while now. 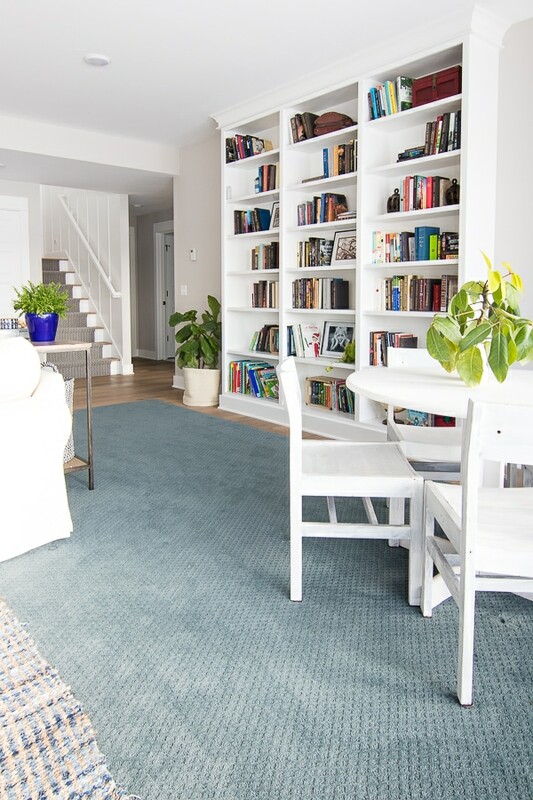 Last week, I shared the 2nd half of our video home tour on Instagram (you can still view it, because I saved it to my highlights) and I got SO many DM’s about floor plan questions, that I thought I would talk about it a bit on the blog today. But how do you decide what you want in a floor plan? For us, this is was our 5th house, so there was some trial and error involved. We made a list of all the things we loved in our previous homes and all the things we didn’t love or rooms we didn’t use. We wanted to make sure we were going to use every square inch of this house. We had an office at our last house that no one ever stepped foot in (in fact I never even blogged about it!) and we wanted no wasted space this time around. For example, once we built the sunroom on our old house, we never ever sat in the living room, because the sunroom was so much nicer. 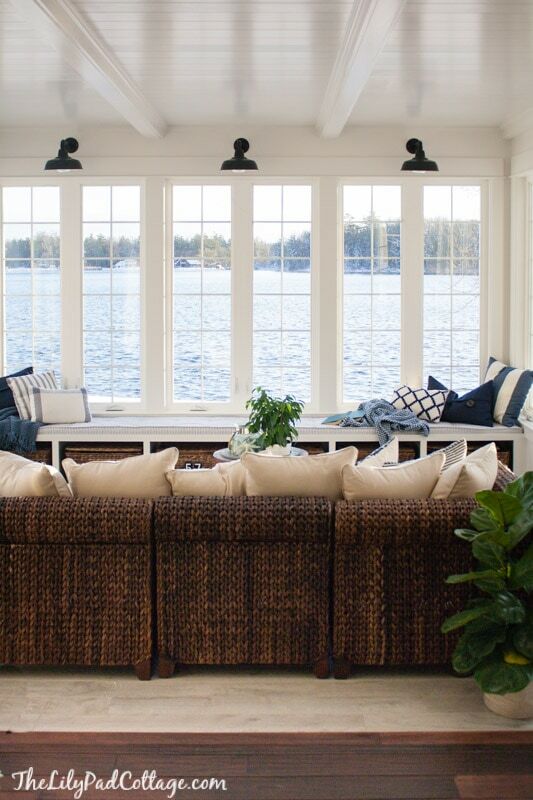 We decided in this house to make our living room feel just like a sunroom. We added all the windows of our previous sunroom, but put the fireplace and comfy furniture in here too – now it’s the best of both worlds. We also realized having a lake home means we entertain big groups a lot in the summer time. We would much rather have large open living spaces that can accommodate lots of people and have smaller bedroom spaces. I wanted the bedrooms to feel cozy and the living spaces to feel spacious. Everyone gathers in our kitchen area, so I wanted to have the living room/dining room/kitchen all open to each other again even if it meant sacrificing on bedroom size. Another must have was a basement area in this home (which wasn’t possible with our last lot) so that as our kids grow into teenagers they have their own hangout space that’s still close by and open for us to check on them. We wanted a bathroom in the basement for everyone in the basement to use, but also one that connected to the outside, so that there is easy access from down by the lake – I don’t want wet feet running through my house. This worked out great for our kids because that meant they both got their own bathroom, but it was practical for the floor plan too. We also realized if it rained and we had a lot of people over for dinner we could only seat 6 in our last dining space, so at this house we have a more formal dining space plus our eat in kitchen area and we can comfortably fit 14 people for dining upstairs. Storage was also high on our priority list this time around. We wanted a space down by the lake so we could store life jackets, tubes, kayaks, outdoor furniture or whatever. Those double doors on the bottom left corner open up to not only storage, but to the bathroom as well. Big living spaces, smaller bedrooms. We cut lots of things out of the budget to get the house the size and shape we wanted. We knew the other things we could change out down the road, but the footprint of the house was key for us. So, what can you cut from your budget if need be? All of the cosmetic things that are easy swap outs. For us that meant using nice quartz countertops in the kitchen and master bathroom, but laminate everywhere else because that’s an easy change down the road if desired. Another place we saved on budget was using cheap carpeting in the basement. I originally picked out this really cool patterned carpet for that inset space that would make it look more like a rug, but it was $6 a sq foot. I swapped it out for this much cheaper carpet that we can replace later if needed (assuming my kids will eventually destroy it anyway). We also put plain jane fiberglass showers in everywhere. Even our master as the cost of putting a tile shower in our bathroom was the same cost as putting the ceiling treatment in our living room. To me, it was more important to have a wow ceiling in a room we use all the time than having a wow shower that just the Mr. and I use. It’s totally doable to rip out that shower someday and tile if we feel the need. Although we would need to look into a better water filtration system, because our well water is hard and rusty. It’s hard to keep even the fiberglass shower clean let alone a tile one, which was another factor that made this an easy budget cut. Put a pretty shower curtain on it (weird fact I hate glass shower doors) and no one even knows it’s not tile. But can you imagine our living room without this ceiling? No way! So places to cut costs, flooring, wall treatments (board and batten etc), countertops – basically cosmetic changes that are easy swaps! 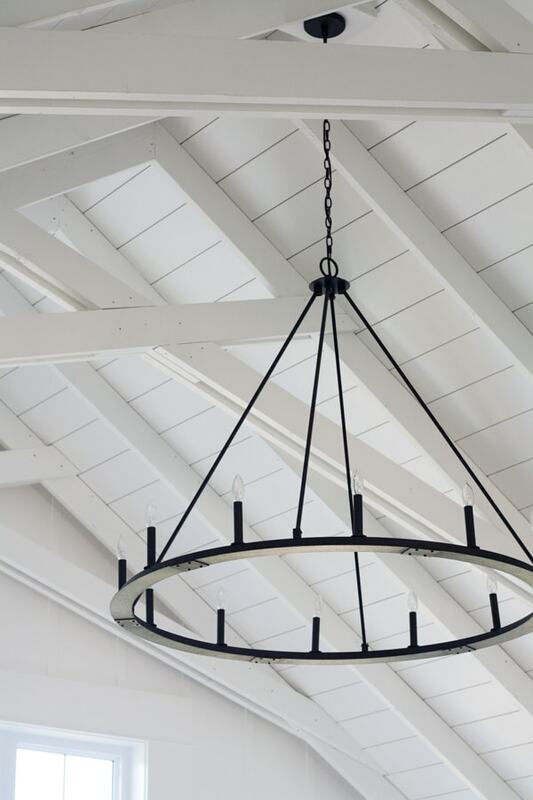 You can even use inexpensive lighting and fixtures to swap out down the road. My biggest recommendation is to make a list of your must haves! Think about how you live, how you use your space, and what is most important to you. We are so much happier with the spaces in this house and it is so much more functional for us. I hope that helps and again if you want a video tour of our house there are 2 highlights on my instagram – upstairs and downstairs! Amazing! Thanks for all the good pointers! Dreaming of building some day! Great post, we are building a lake house too. We have a floor plan and the rest of your advice will definitely be considered. Thanks! OH fun enjoy building Mary Lou, it’s an adventure! Love this post! It’s so rare for design bloggers/magazines to acknowledge that in the real world, most people don’t have an unlimited budget. I appreciated hearing about your well-thought-out planning process and hope to apply this the next time we build or renovate. Ha! Oh the Mr. could go on for hours about the budget, complete with spread sheets ;) I would love to swap some things out down the road but I’m so happy we were able to get the floor plan and spaces we wanted. Great advice! There are so many decisions to make, so it’s helpful to have someone with experience building walk us through it. Your house is absolutely beautiful! Can’t wait to see your house come together! Your home is absolutely gorgeous! Love your decorating style as well! I noticed in your instagram tour that you didn’t show a guest bedroom. Do you have a guest bedroom or what do you do with overnight guests? Hi Andrea we don’t have a guest room, because we are hoping to finish the loft area above our pool house across the street in the next few years and make that a guest house/room area. We have also talked about putting a murphy bed in the workout room in the meantime, but most of our family and friends live here in MI so we haven’t had the need for a guest room yet. I notice you have wood floors in your downstairs. Are they actually wood, or another material? We are starting to finish our walk out basement but I am being told putting actual hard wood floors is not a good idea, for several reasons. Hi Kim, they are engineered hardwood. My builder kind of advised against it too but it’s not in a huge area (we have inset carpet in the main area and laminate floors in the kids rooms) so I was willing to try it and if it ends up being a problem it won’t be awful if we have to rip it out. We have had zero issues this first year with it. Thank you! Do you recall who makes them? WE got them from Build Direct if you go to the FAQ page on my blog or search “lake house flooring” you will find the exact link – thanks! Hi Kelly, I am interested in your the wood floors also- did the contractor advise against the engineered wood because the material is less durable? and was the cost per sq. ft. quite a bit less than installing unfinished wood? We need to replace our upstairs carpet and we’re thinking about the engineered wood floors but I don’t know much about them at this point. Thanks for any pointers! He just advised against it in the basement because we have heated floors down there and they glued the floors down because they couldn’t nail them into the heated floor concrete. He was worried they would shift using glue like that but we haven’t had any issues so far. I think they were about $5 a sq ft? We didn’t install unfinished wood because of our location on the lake. It’s not recommended with the higher levels of moisture. My parent’s went that route and they have refinished the floors 3 times in 15 years because they expand and contract too much. We have to be careful with the engineered wood too with the level of humidity in the house and there was definitely expansion and contraction this winter. If you search “lake house flooring” on my search bar you will find an exact link to the flooring we used. Thanks Kelly, the search option was great! Good advice on the wood color options too, the crumb test is awesome! 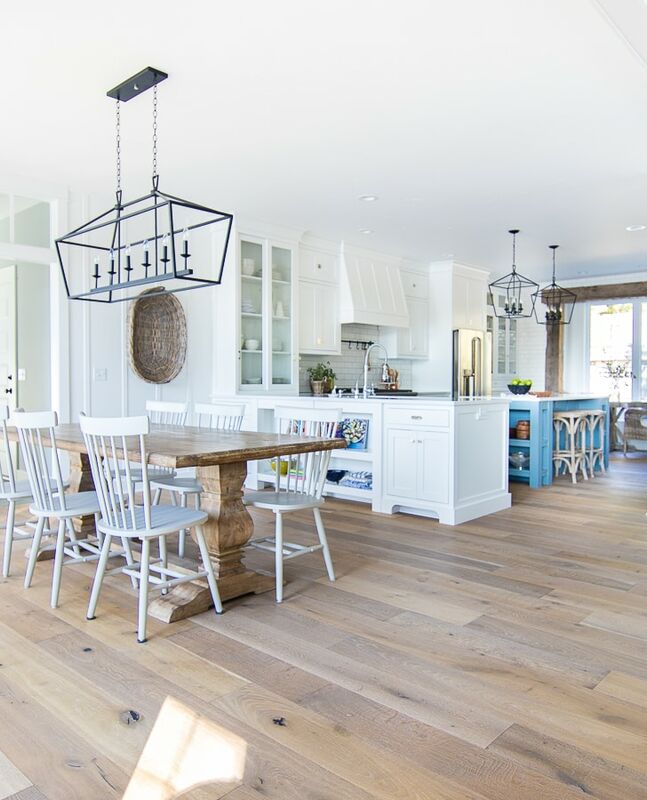 Have you found that the engineered floors hold up well in a kitchen and dining area with kids, pets, traffic areas, etc.? What happens with the moisture? Besides popsicle stains? When we first moved in we had one section of the floor buckle up bc the air conditioning wasn’t running yet and we had a crazy heatwave in the 100’s. All of our carpeting also buckled up so it wasn’t necessarily the floor. We ran a dehumidifier for a week and it went right back to normal. We do monitor the humidity level in the house and keep it at the recommended level for the floors. So we are careful about getting too much moisture on them. Like I would not wet mop them. Where did you find your upstairs couch and how well does it hold up to dirty hands and feet? Easy to clean/do stains come out? It’s from a Midwest chain called Art Van. It has a lifetime stain warranty on it, so they will replace the couch if they can’t get a stain out. So far it cleans up pretty well with just water but my kids don’t hang out up here that much they spend more time in the basement where their toys are. Oh, the misery of well water! (I grew up in the city with city water!) I use a product in my dishwasher called Lemi Shine Booster. It removes hard water spots and film from your glassware. My everyday glasses are Duralex Picardie, the same ones used in French cafes, so I’m told, and they’re still crystal clear! If you DON’T drink your tap water you might want to check out a Berkey water purifier. (berkeywater dot com) We’ve had ours for 8 years now and I highly recommend it. Several friends have purchased one after tasting our water – and coffee, lol. It’s just the two of us now and we use the Big Berkey in our house and the Travel Berkey in our RV. The water tastes amazing because it’s pure! I have ours on the counter near our Keurig but If I had your pantry it would be in there. :-) We each have water bottles that we fill daily and I use it for all cooking as well. My hubby says it’s the best thing I ever bought – and that’s saying something. Again, thanks for such a lovely post today! Oh thanks for the tip on the dishwasher! We have a reverse osmosis for drinking water at our sink and in our refrigerator so the water tastes fine from there but thanks for the tip! Oh good I’m so glad you found it helpful! Love your house and the colors! Did you design your house plans or did you modify a plan already out there! Absolutely gorgeous! From someone who lives with a builder/contractor/designer/remodeler in a busy Midwest market, I can tell you that your list idea is critical to the process. HGTV has been great for business on so many levels (but a problem in others, like when clients don’t coordinate dreams and desires with actual budgets), and the successful hosts always start with “the LIST”. Your home here really shows the thoughtful and realistic planning efforts, combined with the budgetary realities, and future planning. I especially love that you guys knew what you could live with now, and swap/improve later, especially with youngsters! Bravo, once again! Oh my, this was sooo helpful and came at a such good time!! We are building and are trying to decide floors and countertops. It’s so easy to think it all needs to be the best and the very best finishes only. (The husband in not liking the whole house solid hardwood quote, and I don’t blame him!) Love your reminder that these things can be changed later and your example showing that a house can still be beautiful without ALL the top of the line things. Your the sweetest, THANKS!! Yes it’s hard to get everything you want in your dream home on budget sometimes. It’s good to remember there is the “right now” option and the dream option may take a few years to swap out! Simply beautiful! Where is your kitchen table from? And chairs? If you go to the shop our home page on the blog you will find everything linked thanks! Yes ha good memory, I have an entire pillow closet! There is also an unfinished storage area in our basement where I keep stuff too! I’m interested in your choice of flooring. You mentioned saving money on flooring, is it manufactured? This is engineered white oak and I think it was about $5 a sq ft? We saved money on that because I was able to blog about it and get a discount through Build Direct. Wow! Amazing that the ceiling treatment cost the same as a tiled master shower. I would vote for the ceiling too! It’s my favorite thing about your house (well, besides the view! ), and, no offense, but I don’t really care much what the inside of your shower looks like. ;) Also, I had no idea the carpet in the basement wasn’t a huge rug. I never even thought about it not having wood under it. I think you made great choices! Yes that was another area we saved money not having the wood floor go all the way under! Please….more info on tile vs ceiling cost!? What?! I will gladly do away with the tile for such a ceiling. Can you give cost estimate? ALso are you saying you gave up two/three tiled baths or just your master? thanks, best tip ever. I think the ceiling cost around $7k-$8k if I remember right? It was about that for just one tiled shower. We have 3 fiberglass showers in the house so it saved over $20k that we used in other places. Love the home and decorations. Curious, what is the square footage of your main floor? You say you sacrificed footage in your bedrooms – what sizes are they? The one thing my sister failed to take into consideration (and truly regretted) was that her little kids (1, 5, and 8 yo) would get bigger. The boys were both over 6’ in high school! They are still normal sized rooms that would easily fit a queen size bed. I think they are 13 x 15? Love this post! We would like to build in the future and these are all great points I’d like to remember. Thanks for posting! Oh so glad you found it helpful! Hey Kim, it’s not a popular option but I’m with you that amount of money can make such a bigger impact somewhere else! We had one in our last house too and sold within 3 days so I don’t think it was major resale factor in our case anyway. Thanks Holly! Glad to find another glass door hater ha, I can’t stand seeing all my shampoo bottles and stuff either. Clutter makes me nuts! Your home is amazing! Do you mind sharing the sq ft of each level? The main level is 2000 and the lower is 1800 finished – we have some unfinished storage area down there – thanks! Thank you for sharing your beautiful home. After a year of living there, what would you do differently “next time”? I’ll do a post on that – thanks! You are such an inspiration. Your home is stunning and your family is adorable as well! Your post is very helpful to me as we’re in the planning and preparing phase of building our forever home. Thank you for presenting such an organized outlet of design and helpful info. Can’t wait to see your holiday decor later this year! Thanks so much Brooke! I’m so glad you are finding these posts helpful. I’m hoping to put together a few more building posts this fall yet – thanks! We’re in the beginning stages of evaluating floor plans for our new lake house. Your house is exactly what I’m looking for; but perhaps on a smaller scale. I’ve searched online for a plan similar to yours, but haven’t happened on it yet. Do you recall where you found your plan or was it a custom design? What is the square footage of your home? Thanks in advance! Our main floor is 2,000 sq ft and we had it drawn custom by an architect. Thanks! I would love to see your floorplan. We are currently designing our new house and picking out a floor plan is so tough. There are so many things to consider. Thanks for all your input. I have been following you for a while and adore your home(s)! Thank you so much for sharing all of this insight during your build series! 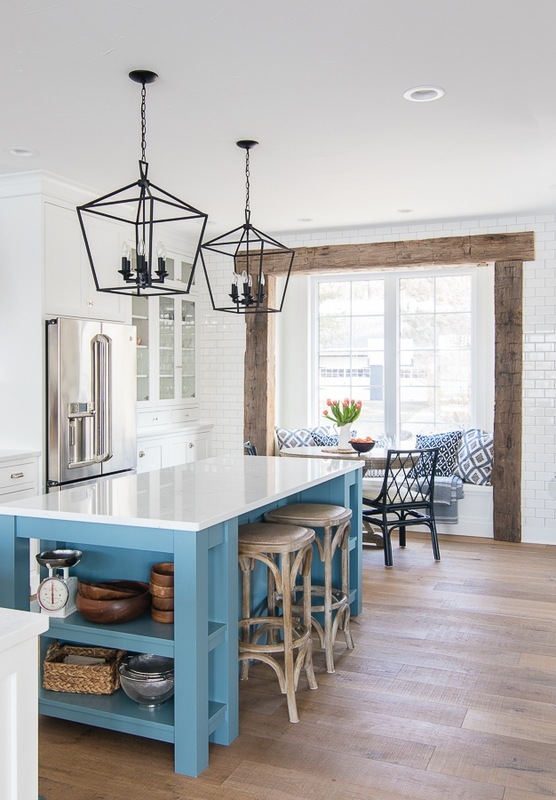 My husband and I are in the process of closing on our dream home and planning the full renovation now, so I’m so glad to have read these posts and found this resource! 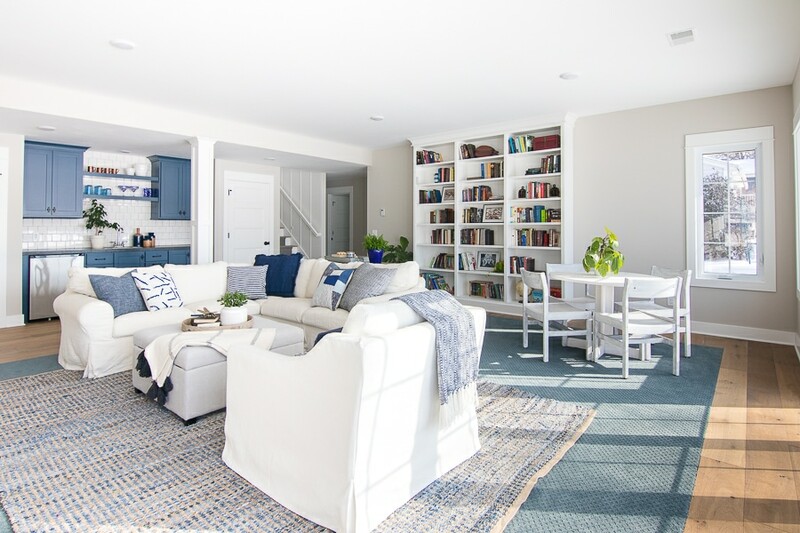 You may have already covered this in other posts, but can you share what paint colors you used on the interior–specifically your basement living room and the whites? I, also, am an emerging blogger and would love the opportunity to partner with companies as we work through this renovation. Do you have any suggestions or tips for going about that process? 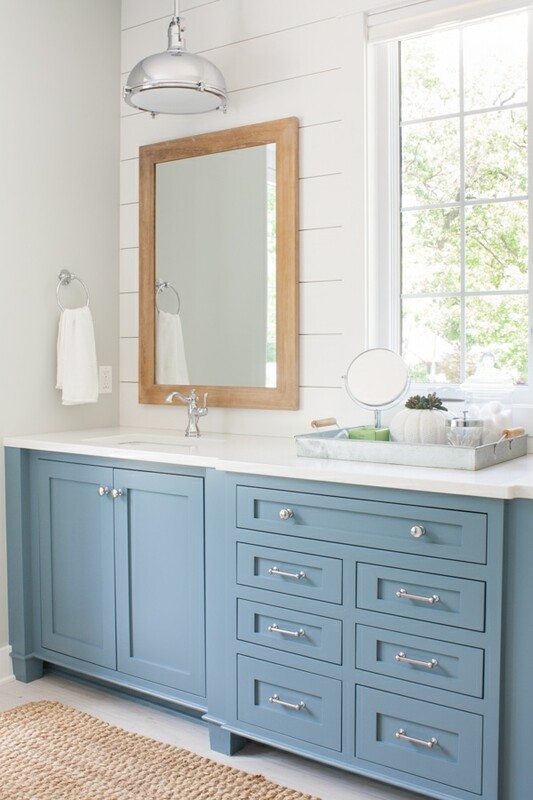 Hey you can find all my paint colors here https://www.thelilypadcottage.com/2017/02/lake-house-paint-colors.html but the basement is agreeable gray! As far as working with brands just keep pitching them. I got told “no thanks” a million times but the few “yes” are worth it!